Citizens evacuating Moadamiya last month. Instead of allowing food to besieged areas, the regime pressures Syrians to evacuate or face starvation, adding to the displacement crisis. Today was another exhausting day. Problems keep piling up. This time the regime sent a committee of five people originally from our town, but now living outside of it, to present a deal to us. Starving a population is illegal. Food should have no preconditions. The regime proposes a conditional ceasefire with the FSA living in our town, but made ridiculous and illegal preconditions! They want us to raise the regime flag inside Moadamiya and they also want all those who are not originally from Moadamiya to leave the town. That means me too, because I’m originally Palestinian. Even though I grew up in this town, they don’t count me as real citizen of Moadamiya. Their demands are stupid and meant to strip us of our dignity and displace us. 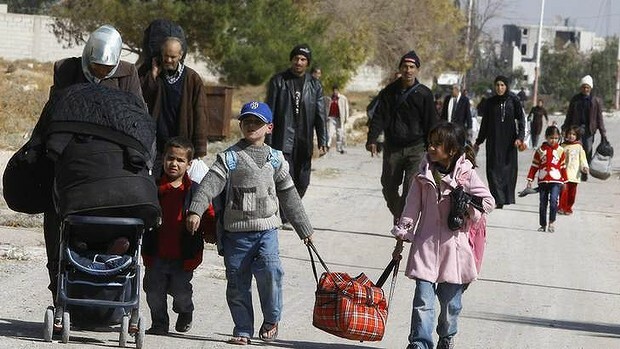 Displaced Syrians suffer unspeakable agonies. I don’t want to become yet another displaced Syrian–adding to my displaced history as a Palestinian. In return for these ridiculous and racist demands, they agree to consider – only consider – allowing some food back into the town. They may allow just a little bit of food per day, maybe enough for one meal for each person. Basically, they want to keep control of food. Even if they agree to let some food in, they will do it in a way where they are still in control and can cut it off once again whenever they want. The townspeople have not come to a decision. The regime made the offer in such a way as to cause problems between the people inside. There is heated debate amongst the people. Hunger makes people not think straight anymore. I am afraid that the council will decide to hand the regime our town on a silver platter. Regime forces have been trying to get into the town for months now and we’ve been trying to keep them out. We know if they come in it means all of us will be slaughtered with knives… as this was the fate of several other towns in Syria once the regime was able to break in. This whole negotiation is simply to add more pressure on the people to kneel to Assad’s will. They know how badly we are in need of food and medicine and they are manipulating our desperation, hoping we will give up on our demand for freedom. In the midst of this chaos, I hold on to my conviction in protesting against this oppression through my hunger strike. After a long and tiring day, I lay on my mattress, aware that my weakened body is trapped under siege in Moadamiya, but a strange feeling overcomes me, a feeling that my spirit is free, free to visit all the places I love in Syria, to walk the streets where I used to work and where my friends and I hung out, free to go to Homs where I went for university. This strange feeling leaves me happy. My body is depleted and exhausted but my spirit is free and happy.